A warm day - like those we're having lately - is a great time to go to the Berkeley Marina. Personally the howling wind and fog that's the usual for that place aren't my thing. It can be bitter cold out there. But when it's hot, it's glorious. The views are amazing, there are people of all kinds doing all kinds of things, and it's relatively cooler because it's right on the water. A recent trip to the Berkeley Marina felt like a page out of a Richard Scarry book. I kept looking for Mistress Mouse to honk her horn as she zoomed by. PS: Getting food at Vik's Chaat on 4th Street is an excellent idea after a Berkeley Marina outing. It's Friday and if you are planning to go to Point Pinole today, go. I highly recommend it. After I tossed out to the world this idea of Foint Finole Fridays I learned that my kids' soccer practices are on Friday afternoons. Both of my kids. And as much as I want to playing at the beach, it's to soccer practice we go. But... But! If you're planning to go, go. You don't need me. I will be back here soon to schedule a new outing. I have about 10 ideas for places to go and things to do. Stay tuned. 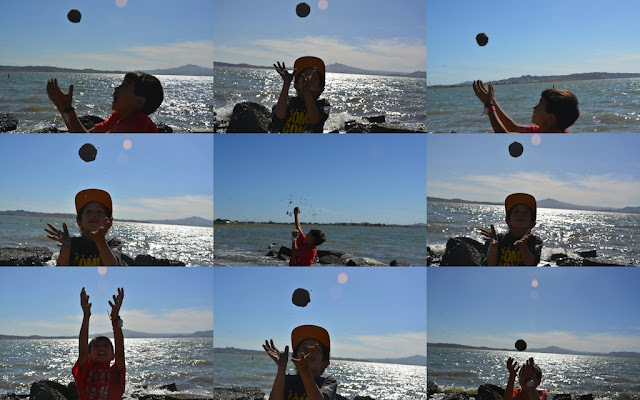 What's really fun is juggling sand balls. Add some mud or clay, and definitely some water, and you have a good sand juggle ball. How high can you throw them and still catch them? How far can you throw them? Can you play catch with a friend? There are probably some physics lessons in here. The tide is going to be high next Friday and so we're not going to do Foint Finole Friday on September 11. The beach is too small at high tide for a proper baseball game and that's our way of measuring the value of a beach. Another Outside Kids will happen soon. Stay tuned for details.